In 2015, new EU rules will require that households in the UK to do more when it comes to removing rubbish from their home responsibly. 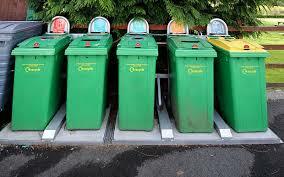 Currently, the majority of councils in the country provide a few recycling bins for homeowners in their area. These might include a bin for paper or cardboard, one for plastics and glass, and another for food waste alongside the standard waste bin. This is manageable when the householder has standard home waste, but when there is more rubbish, or the homeowner is running a business from their property which might generate more cardboard or plastic waste, there may be more than a standard collection bin can handle. The new rules require that councils collect recycling waste separately, which may mean that paper or plastic collections are only done fortnightly. This can mean that homeowners with a larger than average amount of recycling waste will need to choose other options when it comes to disposing of their waste, including glass and metal. Rather than having to take this to the tip every week, and being unable to record such disposal if you are a home business, you can take the step of employing a team of removal experts to help you get rid of excess rubbish before it becomes a problem. When searching for someone to help you remove this recycling waste, you will need to find a rubbish removal or clearance business which is qualified to help you dispose of your waste responsibly. You will be looking for a company who are approved by the Environment Agency, and has the resources to help you get rid of recycling waste. The company concerned will need to have a responsible waste disposal policy, and may also be able to tell you exactly where the waste will be going once it has been collected from your home. Homeowners need to find a rubbish clearance business that they can rely upon, because they will be responsible for where that waste ends up. Fly tipping is being investigated more thoroughly by councils now, and if fly-tipped rubbish is traced back to you, the council could issue a heavy fine. Rather than having to face this risk, homeowners and small businesses need to make the decision that they will only employ responsible and reliable rubbish clearance firms, who can be trusted to handle your waste effectively. When you are searching for a business that fits these requirements, you will want a company that can provide you with good references, and also have the support systems in place which will allow them to collect your rubbish, and a recycling centre which is able to take the rubbish you are discarding. Not all recycling centres will handle the same waste, so it is important that your company are able to take your rubbish to a centre that handles your specific recycling, whether that is glass, plastic or paper.